My grandma used to say for a good meal, she just needed a good salad and good bread. When I think about dinner with my grandparents, it always included a salad, and it always included a Mrs. Bernstein’s salad dressing. But aside from that salad dressing, my favorite dressings were always ones my mom made. That’s probably why I also love making my own salad dressings. Though, I still have a few favorite store-bought dressings I love, because let’s honest, who has time to always make their own dressings?! This salad dressing really is “magical.” I would never think to add cumin to a salad dressing, let alone applesauce or maple syrup, but this is really good. I omitted the miso because I don’t eat soy. I don’t know what it’s supposed to taste like with the miso, but the final product how I made it below is great! The only downside to the recipe is it makes just 4 servings, so you’ll need to double the recipe, if you want enough to enjoy throughout the week. Bon apetit! 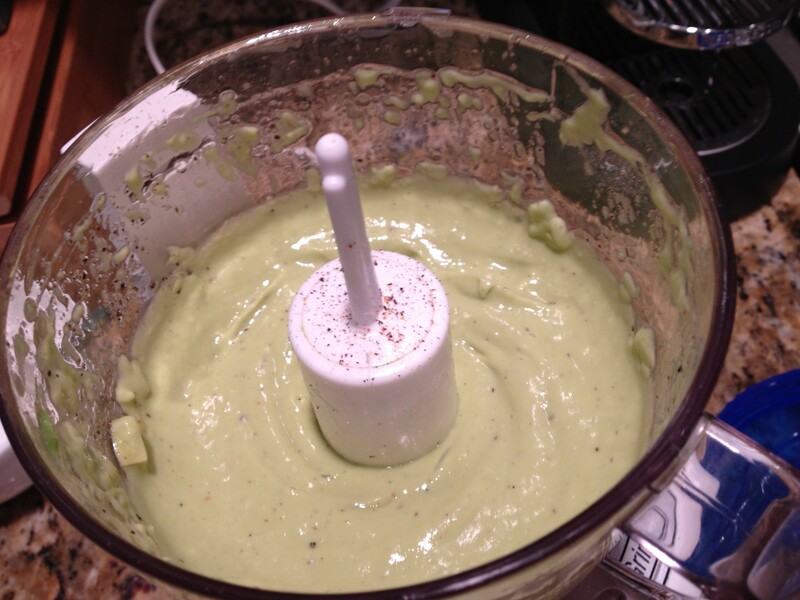 Place all ingredients in a small food processor and blend together until smooth. Adjust for seasonings. Add a little more maple syrup for a sweeter dressing OR add a couple teaspoons of water for a thinner dressing. NOTE – you may need to double batch to make it easier to blend in the blender or food processor. I generally prefer vinegar-based salad dressing but there are definitely days when I crave something a little more savory. 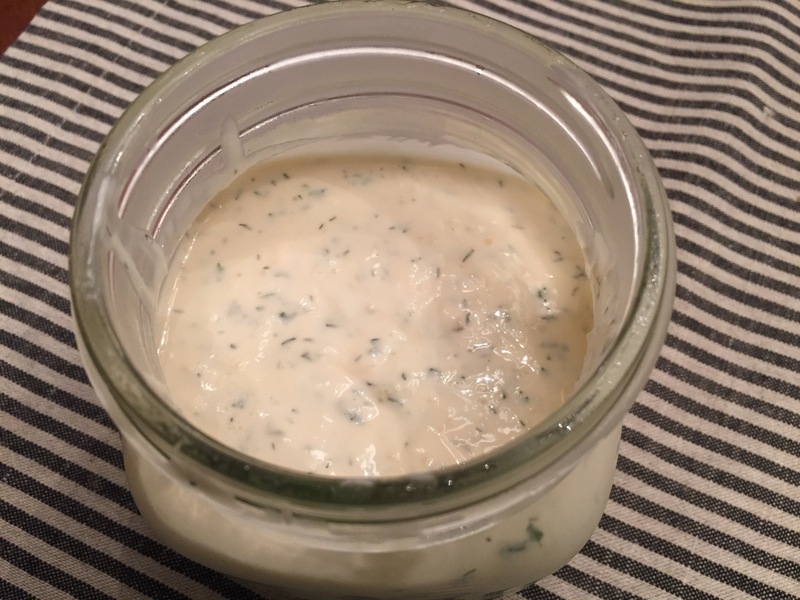 I’ve found two great Ranch dressing recipes, that just happen to also be vegan. What I love about these recipes, is that even if you’re not vegan, you can just swap out the Vegan mayo with an egg-based one and it still tastes great. Put all ingredients in a small mixing bowl and whisk together until smooth. This is probably the easiest recipe I’ve made in awhile. Prep requires some chopping and assembling and that’s it! The recipe says this serves 2, but we felt it’s better with about 6 servings because the dressing makes it pretty indulgent. I think it might also taste great with a vinegar-based dressing but not quite sure which one yet. Let me know if you have any ideas! Enjoy! Put all salad ingredients in a medium mixing bowl and gently stir together. Set aside. In a small mixing bowl, whisk together dressing ingredients. Pour dressing over salad and stir until coated. 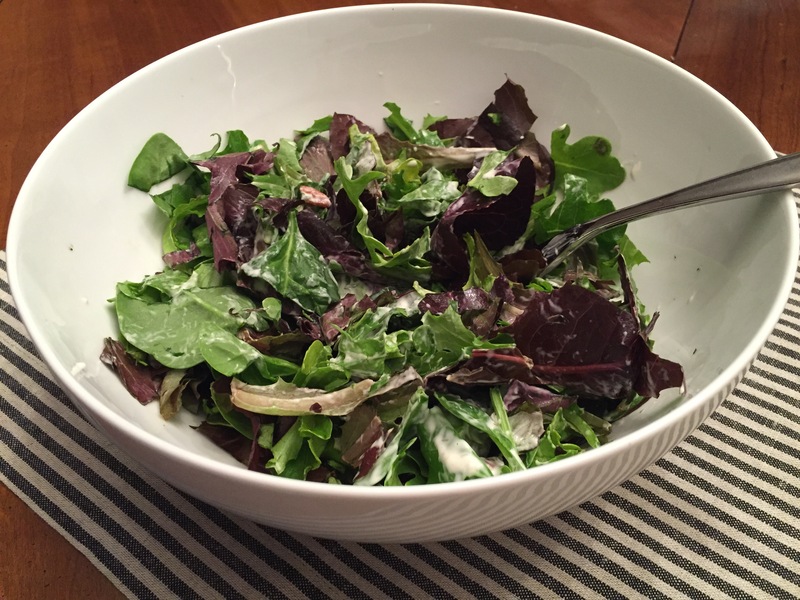 Salad can keep for up to 3 days in the fridge. *I used florets that come in bags you can steam in the microwave. Frozen won’t work here. You could certainly also use fresh broccoli sold in bunches. Surprisingly, the broccoli becomes softer when mixed in with everything. I also tried to pick broccoli pieces that had short stalks, so it would be easier to eat. In several of the new cookbooks I’ve read recently, a recipe for “Socca” has appeared three times, prepared in three different ways. It’s made from a batter of garbanzo bean flour, water and oil, and sometimes other seasonings. It seemed so simple, and the pictures looked really good, I’ve been so curious to try and see what it tastes like – I can’t recall ever eating something made with garbanzo flour before. I’ve now made 2 of the 3 recipes, and I honestly can’t believe how incredibly easy it is to make AND how good it tastes. I will say cooking it in the oven yields a more savory final product, but the stove-top recipe couldn’t be easier to make. Both recipes are below and you can decide for yourself which you prefer. 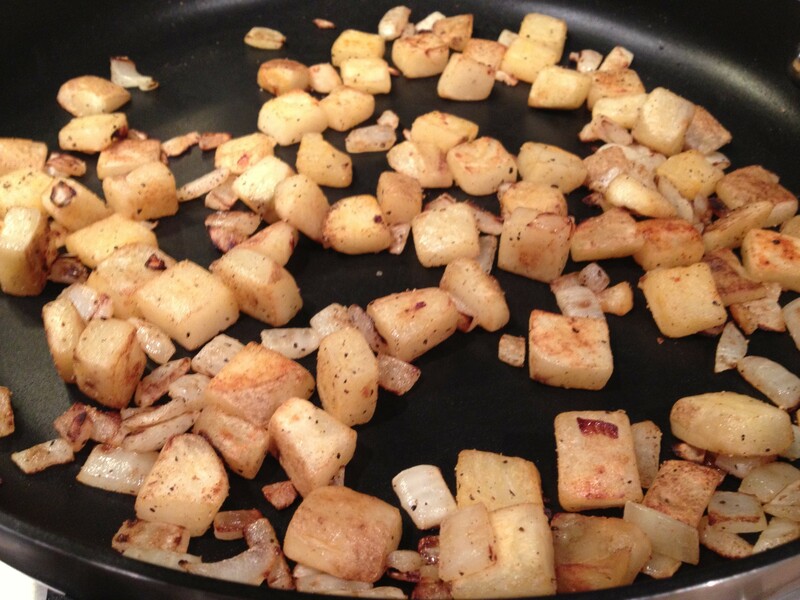 Place a 12-inch cast iron skillet inside the oven and preheat to 450. In a medium bowl, whisk together the batter ingredients excluding the water and the oil. Now, slowly whisk in the water and 2 tbsp of the oil. Allow the batter to rest for 15 minutes to 2 hours. While the batter rests, slice the broccoli florets. Arrange the florets in a single layer on a lined baking sheet or coated with nonstick spray and drizzle with 1 tbsp of oil. Set aside. Once the batter is done resting, coat the hot skillet with 1 tbsp of oil and pour in the batter. Place the skillet on the top middle rack in the oven and place the broccoli pan on the lower middle rack in the oven. Bake for 15 minutes. Remove the broccoli from the oven after the time is up. Now, move the top rack to its highest level and broil the socca for about 5 minutes, until slightly crispy on top. Be sure to keep an eye on it, ensuring that it doesn’t burn. Remove the socca from the oven and allow to rest for 5 minutes. Top with a layer of hummus, followed by the broccoli and finally the sprouts or microgreens. Cut into wedges and serve warm. To make the batter, whisk together the chickpea flour, olive oil, and 2 cups of water and season with 2 big pinches of salt. When ready to cook the pizzas, heat an 8-inch nonstick pan over medium-high heat. Add 2 tbsp of olive oil, pour in about 1/4 cup of the batter, and cook for 3-5 minutes, until the bottom is crispy and the top is almost set. Carefully clip the socca and cook for 1 minute more. Transfer to a plate a dress with your desired toppings. Repeat with the remaining batter. This recipe yielded way more than the recipe listed. I’m still not sure why that happened. I also noticed that after the first batch, the socca only got crispy if I added more oil in before the new batch of batter. I topped the “pizzas” with some tomato sauce, a few sprinkles of dried oregano, and some halved cherry tomatoes. 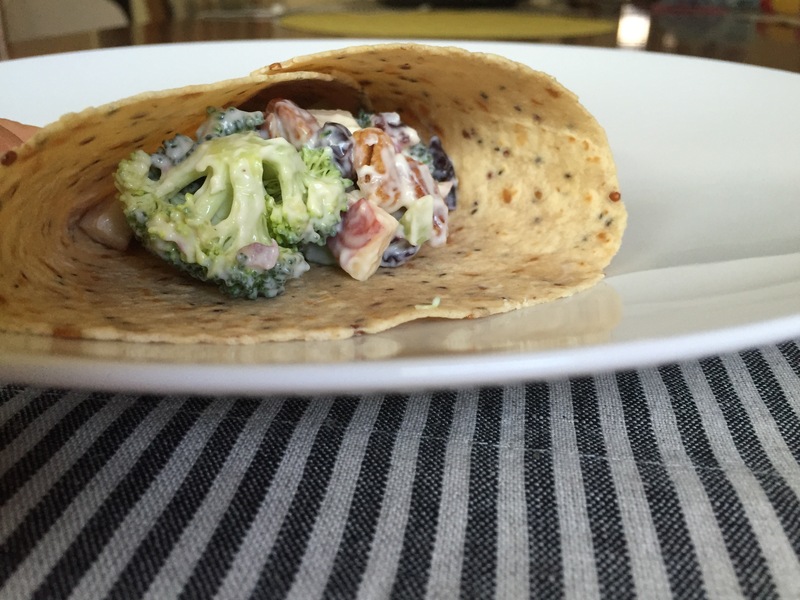 This recipe was way more kid-friendly than the first for us. Sprouts market recently opened near us, and in our exploring, we are trying some new-to-us veggieburgers varieties. We really enjoy the Gardenburger Black Bean Chipotle burgers chopped up and put into a salad. It’s one of the quickest weeknight meals to make – about 10 minutes in a non-stick pan to cook the patties, and the salad can be assembled in that time. Just as delicious and quick to prepare is the next brand we tried – Boca Burger Original Vegan (with non-GMO soy). Because we knew this one tastes more like meat, we decided to make a hamburger like meal out of it – resulting in quite the delicious Veggie Burger Salad Stack (pictured below). 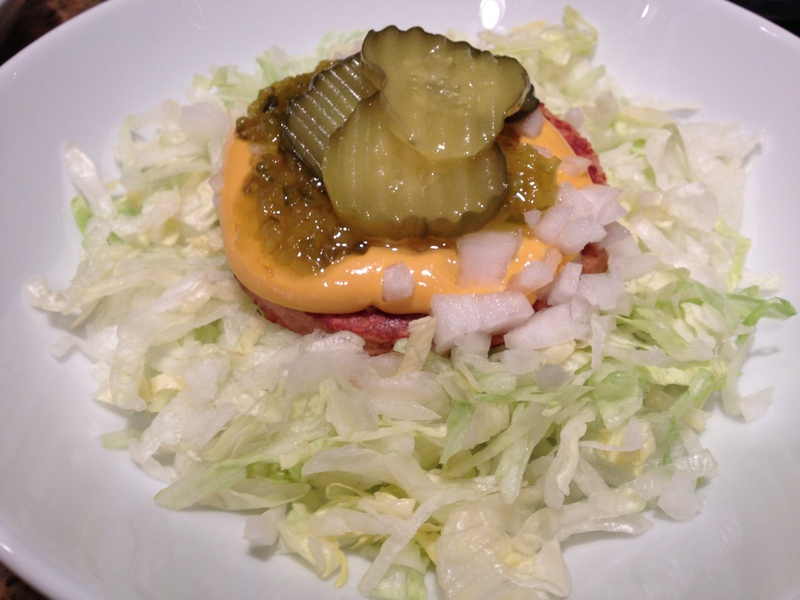 The patty is placed on top of shredded iceberg lettuce. For the toppings, we put mustard, chopped brown onion, ketchup, pickle relish and some pickle slices. It’s a fork-and-knife kind of meal and delicious through each bite. In fact, Scott still has a hard time believing the Boca Burger patty isn’t meat! What are your favorite ways to enjoy a veggie burger at home?